For my Sunday share - two very quick Cards for Kids. I've taken these photos under natural light without getting my light box set up, so my apologies for the reflection and spots on the photos. We have a Q-stone worktop in the kitchen with bits of mirror/quartz embedded and it bounces light everywhere! Both cards are clean and simple and quick to do. The cardstock used for the girlie card is Pretty in Pink and Melon Mambo. I stamped all the images in Black Stazon on watercolour paper and used an aqua painter to colour the images. By squeezing the lid of the classic ink pad whilst shut, ink transfers onto the lid which you then use as a palette. The "ballerina" is from "Under the Big Top", page 31 in the main catalogue, and on the front I used the floral image from Confetti on page 77. For the boy's card, I used Island Indigo cardstock, (2011-2013 in colors spelt the American way) and ran the front of the card through the Big Shot with the Stripes embossing folder. 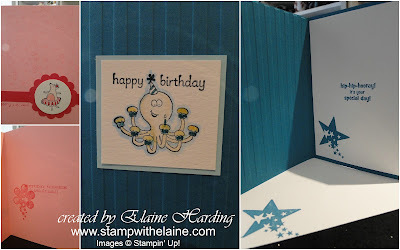 The Octopus is from the Kidoodles stamp set on page 32 and both cards had Sprinkled Expressions a free stamp set given away free by Stampin' Up! for every £45 spend. The greetings were from Happiest Birthday Wishes, a specially priced exclusive Hostess product which can be purchased with Hostess Pounds if you host your very own workshop.